It’s the first day of the Royal Cornwall Show, in Penzance for the first time since 1912. And has the Clerk of the Weather smiled upon us? He has not. The rain started at breakfast-time and now it’s pouring down up here at Trengwainton. Cars are slithering about on the grass – or what used to be the grass. Penzance has always been a good venue, what with the excellent trains and all the West Penwith farmers. The 1912 attendance of 21,454 hasn’t been bettered by any show since (unless you count the two in Truro, where they had royalty, which is hardly a fair comparison). At Launceston a few years ago, they struggled to get the numbers above 17,000. Wadebridge in 1924? The absolute nadir at 13,373. So Penzance has been determined to put on a show. There’s an arch right across the road as you come up from the station, and flags and bunting – looking a bit bedraggled at the moment, granted - all the way up the Trengwainton road, right out to Alverton. 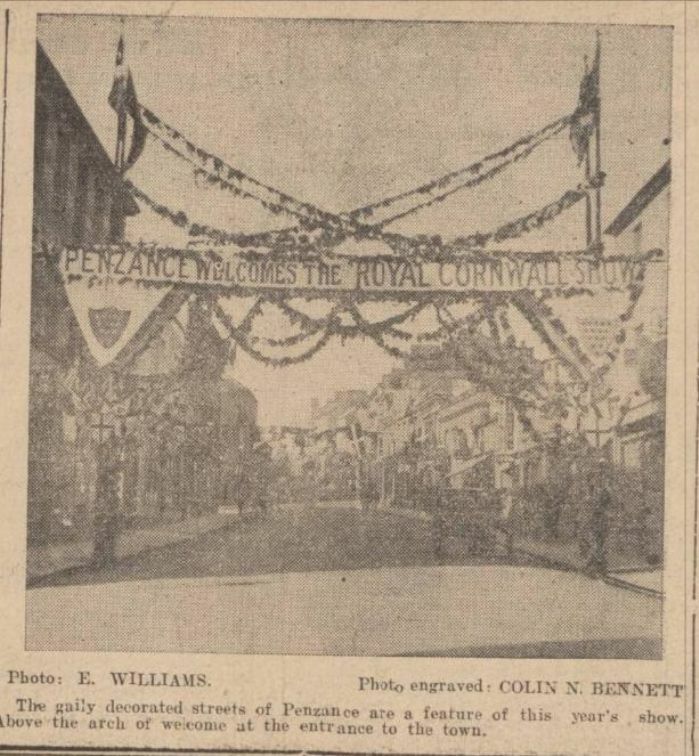 The AA and RAC have been helping the Head Constable of Penzance to keep the traffic in order. There are classes for light and heavy horses, eight breeds of cattle, three each of sheep and pig. Some local winners already – Mr Garland of Hayle with his Shorthorn bull for example. RF Bolitho’s done well with his Jerseys, and for Mr Hoskin at St Buryan, two Guernsey calves placed first and second. And should you tire of the animals, there are plenty of other attractions. Milking and butter-making contests, the blacksmiths squaring up to see which is this year’s champion of horse-shoeing, and a competition for acetylene welding. Mr Noy of Bread Street is on Stand 15 with his hand-made furniture. Note the “quality of the wood”, the “originality of design”, the general “note of distinction”. These “cabinets and corner-cupboards, beds, chairs” will last a lifetime, or beyond. For those fortunate enough to own them, they are the heirlooms of tomorrow. The Coldstream Guards are appearing at the showground during the day, and coming down to the Morrab Gardens in the evenings. So we can only hope that it brightens up later. Not that there’s any sign of that at the moment. It was a lovely day last weekend for the Humphry Davy centenary jollifications. And now this. Midday already, the ceremonies over, the rain just pelting down, and attendance only 3,500 so far. They’re just trickling in, if you’ll excuse the pun – every minute that goes by, just another four or five running along with their umbrellas and galoshes. . We’re going to be way behind Bodmin’s figures for their opening day last year. It just isn’t right. Some of the older folk say the terrible weather we get these days is all down to Marconi. And I reckon there could be something in that. Cornishman 12th June 1929 page 7, Mr Noy advert page 4. Rumours blaming radio transmissions for stormy weather were frequent in the early 20th century.